As the world’s oceans are drowning in plastic, with a truckload deposited into the sea every minute, Jeremy Darroch, Sky Group’s CEO, speaks with CCTNE’s Elizabeth Renski about his ocean rescue leadership and Sky’s business transformation to eliminate single-use plastics from its operations. Why the Ocean for Sky? How does it fit with Sky’s overall purpose and values? The Ocean and Sky – there is a natural connection there… We believe we have an opportunity to have a positive impact on the things that are important to us and to our customers. Plastic pollution is one of the largest manmade environmental disasters that we are facing on our planet. We first came across this through Sky News when it started to report on the amount of plastic that was being found on beaches around the world. From that, we launched Sky Ocean Rescue in January 2017 with over nine million people aware of the campaign in the UK since then. It has become a central part of the work we do in trying to run a responsible business. What exactly are you committing to with Sky Ocean Rescue? 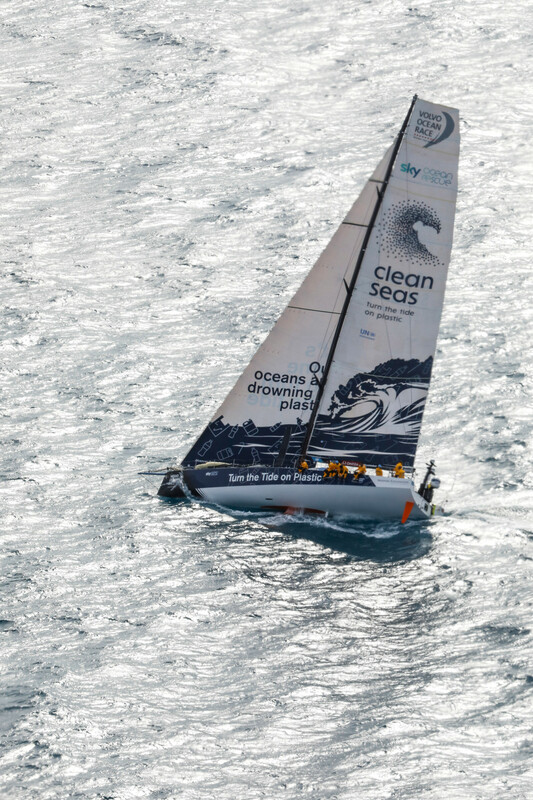 Sky Ocean Rescue aims to inspire simple, every day changes to stop our oceans from drowning in plastic. It’s a three-prong strategy. First, it is taking care of our own business. We are going to eradicate all single-use plastics from our operations, our products and our broader supply chains by 2020. Second, we have created an innovation fund to help find alternatives to single-use plastics throughout supply chains in particular. We have committed £25 million of our own capital to establish that, but we want to try and work with others. Third, we are inspiring action and behaviour changes by using our own voice and working with key partners. We have a big voice and we can use it to lobby and to shine a spotlight on some of the issues the ocean is facing. For example, we have commissioned eight documentaries, four of which we have already produced and another four that are in the pipeline, where we can choose particular topics and bring them to life for our customers. In one of them we looked at ocean plastic on beaches, for example. We followed a sad story of a whale that was grounded in Norway and examined the post-mortem done on it to look at all the plastic it had swallowed. One of our partners is WWF, who we are working with to protect four marine areas – two in the UK, one on the west coast of Italy and one in northern Germany. We will try to bring to life what a marine protected area means and what type of work is taking place to create more sustainable areas in the ocean. What results have you delivered to date? We have had a strong reaction from people, both inside and outside the business making their own commitments to Pass On Plastic. We’re also starting to transform our own business. We’ve eliminated, for example, plastic bottles from our sites, which has saved around half a million bottles a year. We are now starting to change our own supply chains. 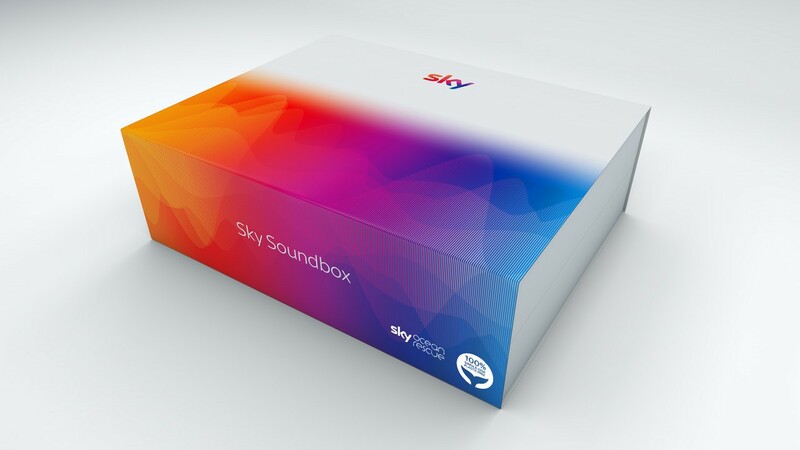 We’ve launched a product called the Sky Sound Box. It’s a home amplifier that has no single-use plastic in its packaging. We’re working with engineers to remove the plastic shoes they put on their feet when they go in to customers’ homes. We have our own TV production that will be single-use plastic free. 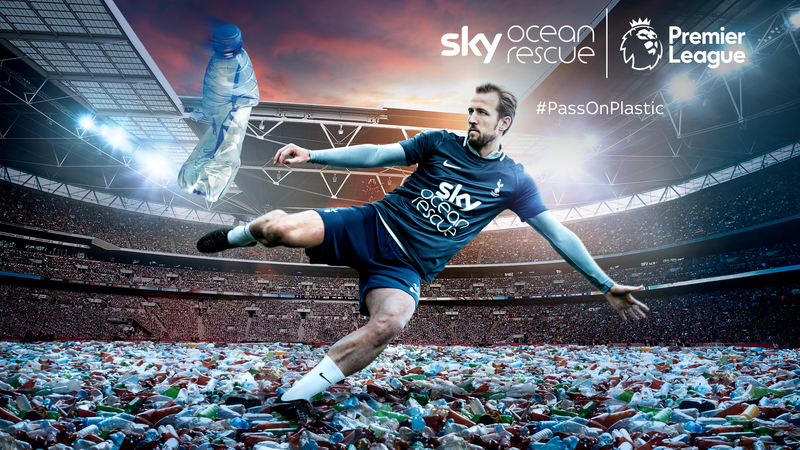 We’ve just announced a partnership with Premier League football in the UK and they are joining the cause, which follows on from our other recent sporting partnerships; we have partnered with Turn the Tide on Plastic, a team competing in the round-the-world Volvo Ocean Race; and are working with the KIA Oval too. 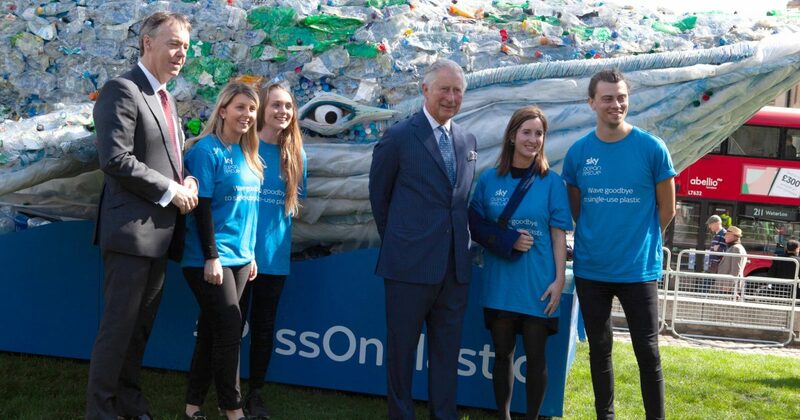 And we’ve taken a whale called Plasticus on tour around the UK to raise awareness of how much plastic is dumped in our ocean every second and inspire everyday changes. We’ve achieved more than I thought we would in 12 months, but we need to keep our foot on the gas and find new things to do and new people to partner with. You are a business leader who is effecting real change. Why is this so important to you on a personal and leadership level? I’m incredibly lucky in terms of what I get to do and, like all leaders, I have an opportunity to make a difference. For us at Sky, and me personally, we have chosen to show responsibility for the environment, largely because we only have one planet! I think of my own children and the state of the planet they are going to inherit. If I haven’t done my bit, that would not be right. The passion I have is shared by my colleagues at Sky. Whenever we do something, everyone is very supportive. For example, we have produced a programme where we worked with the state government in Acre in Brazil to save a billion trees in the rainforest by making them more valuable alive than dead. That was particularly successful. We worked with our customers and created the largest corporate giving programmes in the UK. I’m a WWF ambassador, so I have seen the incredible effect that WWF has as an organisation. Your personal passion is one of the key ingredients to this success, isn’t it? Yes. I think so. I have a chance to use my own voice and influence, and this is why I really want to throw all of my efforts behind it. I think you have to lead from the front. If you are committed to something as a leader and you are authentic about that, others see that and, more importantly, if you are not, they see that too. I have learnt over the years at Sky that if I can get behind ideas, others will follow. That’s how we start to turn an idea into a movement in our business. If we join forces with other people, we become part of a broader, global movement. You very much put the plastic/ocean issue on the agenda in the UK. What stood out as the key moments for you? It is very encouraging to see other media organisations, and newspapers in particular, starting to focus on this. Over time, this will become more important to consumers and that will drive a real change in businesses too. How hard has it been to trigger this business transformation process and become single-use plastic free by 2020? Doing it by 2020 is not going to be easy, but starting this transformation was not particularly difficult because once we started talking about it, a lot of people in the business said they wanted to get involved. Our experience with a lot of our suppliers showed us that they are very keen. We saw this originally when we became carbon neutral ten years ago. We are in a good position to help a lot of our suppliers by showing them what we have done and sharing our learning. There is a lot of work to do, but we have a very clear plan. It will require rigorous monitoring and follow up, a little bit of money and a lot of commitment, but I think it will make us a better business. If you come in to one of our sites, you will have cutlery that is made of corn starch rather than plastic. We don’t just talk about change; we act upon it as well. What’s your call to action for other businesses/retailers? We try to be very open about what we are doing and, because we have gone into this early, we can share our experiences with others. This is not an issue that anybody could own as such. It is universal. 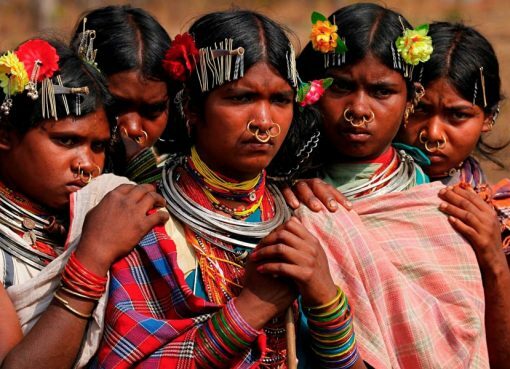 This is an area where governments and NGOs in particular have taken a strong lead. We are seeing some really encouraging policy change, particularly in the UK. I think both the UK and Scottish governments have been fantastic. Now business has to step up. We know that businesses can be so important when turning policy into action. This is where we have to recognise that government has shown the way and we now need to do our part. It’s easy to take action, as plastic pollution is so visible to everybody. It can be hard to change habits, but plastic pollution is something people can understand and act upon. Businesses that say they want to show leadership and be more responsible will get a good response from customers. The second thing I would say is you’ve got to commit and do this publicly, so you carry it through. Increasingly, consumers are responding positively to businesses that want to do the right thing and are responsible when it comes to the environment. It is not a massive trend yet, but I think it will grow. Do you believe it is possible to do good business and achieve social/sustainable outcomes? Yes. For me this is essential. These two things go hand in hand. I think all the evidence is pointing to the fact that businesses that are socially responsible and sustainable in their operations will ultimately become more durable. Therefore, they will be around for longer and customers and shareholders will reward that behaviour. It is not only possible, it is becoming an imperative. It is a big step for Sky to create an innovation fund to solve the plastic challenge. What is behind it and what are its ambitions? One of the core things found at Sky is innovation. We invest in our core business by creating ideas and supporting innovation. We now want to support new business models that are trying to drive change and make an impact. Not only are we able to invest in some of those businesses, but we can also give them access to Sky. For example, we have an emerging programme called Innovators in Residence, where we’ll work with a business and invite them to our West London campus where they can try out their transformational ideas and get immediate feedback from our employees. We can give a small business with a great idea access to some of the things they find difficult. Initially we’re going to focus on new business models that will reduce consumption and waste of single-use plastics along the whole value chain – anything from alternative materials to new recycling technologies. We’re going to look at different levels of investment from concept ideas to more mature business where we can make some targeted investments in existing companies. We are also thinking about using our convening power and create our own events and challenges. This will foster new ideas and help turn those into initiatives in which we could invest, or even just give some seed funding to people who have good ideas, so they can get going while their ideas are quite nascent. Tell me about the partnership with National Geographic? Soon, the leaders of the seven most advanced economies will be meeting in Canada to address the most burning issues of our times . What are your hopes for the G7 Summit? I think it is very encouraging that ocean health and ocean protection are so high on the G7 agenda this year. The UK Prime Minister May and the Canadian Prime Minister Trudeau and his government are leading the way here. The Summit is a great opportunity and I hope it will set a pathway for a broader global agreement to protect our oceans. As part of that, I hope it will tackle the scourge of plastic pollution. Our knowledge of the problem and the solution is good. This is something we can fix if we want to fix it. If the G7 can set a leadership example, everybody else can follow that. At Sky, we will certainly continue to do our bit and encourage others to do their bit, too. Sky is not the limit, then. Jeremy Darroch joined Sky as Chief Financial Officer in 2004 and was promoted to Chief Executive Officer in 2007. Under his leadership Sky has been transformed from a UK satellite pay TV business into Europe’s leading entertainment company operating in seven different markets. 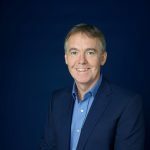 Mr Darroch’s drive and vision has enabled Sky to become a multi-product consumer business, selling a broad range of services across a wide variety of devices and networks to 22.7 million customers across Europe. Over the 10 years Mr Darroch has been the CEO, Sky has outperformed the FTSE 100 and its competitor set to create value for shareholders while also contributing significantly to the countries and communities in which Sky operates. Sky is proud to be a major employer and tax payer. In 2014 Mr Darroch was appointed Non-Executive Director of Burberry Group plc in 2014 where he serves as Chairman of the Audit Committee, a member of the Nomination Committee and from 1 July 2017 as Senior Independent Director. He is a Business Member of the National Centre for Universities and Business and was previously a Non-Executive Director and the Chairman of the Audit Committee of Marks and Spencer Group plc. from 2006 to 2013.